Fourlegs, the night I first met him. Dropping the legs has been done voluntarily by the spider. 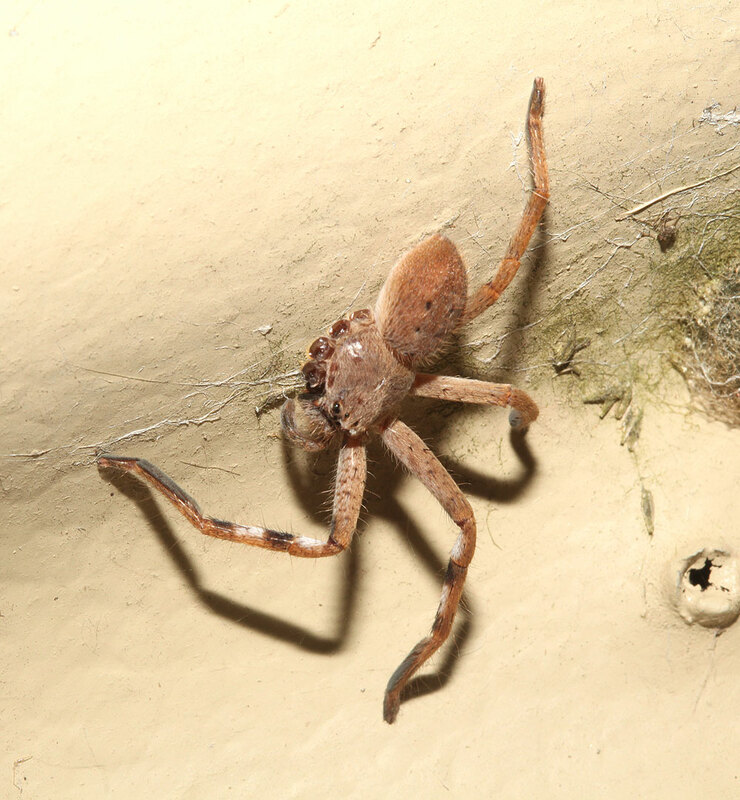 The ability for a spider to decide to drop the leg is called autotomy, which is under the spider's control. Apparently they don't do it under anaesthesia. Muscles close over the joint, the haemolymph (blood) pressure then presses on the joint membrane and seals the wound. To drop four legs, poor Fourlegs must have been in a tight spot - either something had caught his legs, or he had trouble extracting them when moulting - so the legs are still in the shed skin. 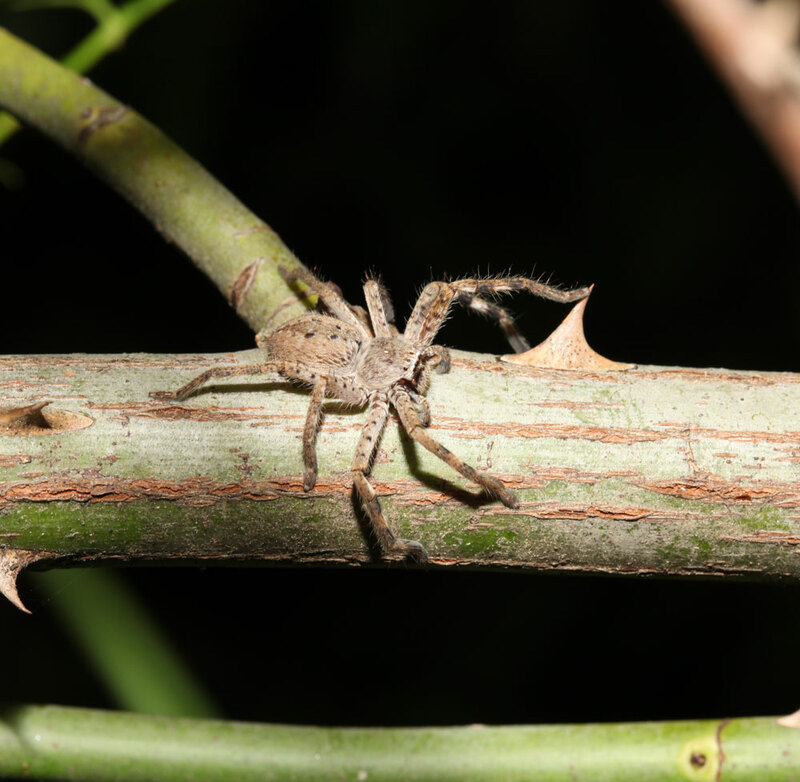 If bitten by a wasp or bee, the spider can drop the leg before the venom gets to its body. I don't know Fourlegs' story, but given it was four at once on one side, I am tending to believe it was a moulting mishap. If Fourlegs moults again, then the legs will regrow, although they will probably be smaller and weaker. But at least he'll have them. If he's an adult, then this is it for life. I've seen lots of spiders with seven legs, a few with six and even occasionally five. But never four. And all on the same side looks horrible. The good news!!! Fourlegs was feeding last night. You can see the mashed black thing he is holding to his mouth, which is on the underside of his front section, his cephalothorax. He is using his left palp over on the right side and often seems to balance by bringing his left foreleg right across. Fourlegs feeding, on the second night. He also seems to have spun some silk around and is using it to help maintain balance. He looked very weird with his legs in a strange position, and hanging suspended, but I wonder if it was the only way he could hold his prey. I was sure he was dying, but he was there again tonight, and all is well. He has been out for three nights now - so has survived this way for at least three days. Not far from the same spot. I will keep you updated if I see him again. Just in case you want a lovely photo to finish on, I did manage to photograph a spider of the same size and species a few nights earlier, about ten metres from Fourlegs' current location. I have decided that it was him - because I want to. Don't look too closely and spoil my delusion. The rose thorn gives you an idea of his size. Please don't make any gory or sick jokes about my spider. I am extraordinarily fond of Fourlegs and desperately want him to survive, moult and have to be renamed Eightlegs. for me, this would be all the reason I would need to capture him and nurse him back to health. I know, it is not the naturalist's way to do that, but I cannot help myself, I am extraordinarily fond of spiders, especially the less than perfect ones. My fist wolf spider was named Seven, due to the fact she was missing one leg. Thanks for sharing. I would do that too!!! I'd feed him crickets and talk to him in a squeaky voice. I did think about collecting him and keeping him, but I have never kept a spider in captivity and worry that he would do worse in my care than left to fend for himself. That was why I was so overjoyed to find he was feeding. I try to be a naturalist and observe - I suspect there are few observations of four legged huntsmen in the wild, but I am extraordinarily fond of, and concerned about, Fourlegs. I haven't seen him this morning, but that is usual. They are much more active at night. I go out and check every hour! I don't expect to keep seeing him - they tend to move around, but I can hope. In terms of nursing him, I have no source of food for him - no crickets. Our pet shops don't sell them because spider keeping isn't common. Hopefully I will see him again and update this blog. I admire the spiders ingenuity! He will be okay. I think this would serve by making him an even better spider in the future. I haven't seen him for two nights now. But as huntsmen move around, that's no reason to assume he hasn't survived. I'll keep hunting for him. OOOOOOPs, he was not a juvenile. I saw him a month later, still with only four legs, but clearly engorged palps. Had he been a juvenile, then he would have regrown the legs with subsequent moults. But he didn't. Last I saw he was only a few metres from his usual location, but clearly ready to mate. I will post the photos when I get this blog active again in a week or so. Don't think last comment worked. I have a four legged spider. Evenly spaced legs. No idea what type. Never seen anything like it. Thank you for your comment. There is no way to publish a photo here. Maybe contact me through facebook? I look forward to seeing your photo. How long did Fourlegs make it? I have to know! I can understand! I saw him regularly for about a month, always around the same area. As he had engorged palps by the last time I saw him, indicating that he was a mature male, it was his time to go wandering, mate (hopefully) and then die. So he lived a pretty normal life. He didn't molt and never gained the extra legs back. Thanks for your blog- you've answered many questions I've had since 3pm when I saw a four legged left side only huntsman today! He (or she? I don't know) looked smaller than your regular huntsman but maybe that's just this breed. It appeared to also use its abdomen to help move- it was on a leaf! Ia m delighted ot hear of someone else who has seen a four legged spider. It's rally interesting that the legs were all on one side. I assume that is because something caught it by the other four legs, such as a bird with a long beak. There are various species, some are smaller than others. I'd love to hear more if you see him or her again. Thank you for writing! Spiders are so cool. I had to write an essay about them for a test and I fell in love. Hope Fourlegs is doing well. Nice Blog, I'm learning so much. I am afraid that Fourlegs is long gone. This is an old post. 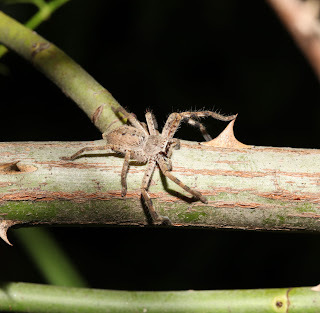 I will get back to this blog soon - I am flat out with a fast approaching deadline on my new book but I have lots of spider stuff collected and will add it soon. I am so glad to hear from another spider lover! This gives me hope! Early last week one of us must have accidentally opened an internal sliding door on a huntsman as I found several legs on the ground and peered up to spot it hiding in the door track. I popped a sign up on the door to remind us not to open it and a day later, it was gone. I was worried it'd died, but just spotted it on a wall today. Having lasted a week with four legs (two on each side), I'm hopeful it'll last longer. What a sad story, but also a hopeful one. I do hope that it continues to thrive.